the SM-B-80TE and the SM-B-80TC training boards seem to be the first computers made by Sharp having the general public in mind. At the time, a professional division of Sharp already sold a range of computers called Hayac. These boards, as well as the first MZ computer series were conceived by the Sharp parts division as a market test. 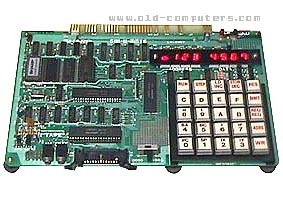 The same board concept could be found in the USA since 1985 (MOS Kim 1, Intel SDK-85) but Sharp was one of the first manufacturer, with NEC, offering a Japan made training board. SIZE / WEIGHT 27 (W) x 19(D) cm. see more Sharp SM-B-80TE Ebay auctions !